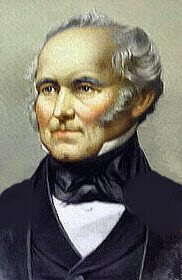 On this day in 1839, Samuel Cunard, having won a government contract to provide mail service from Liverpool to Halifax, Boston, and Quebec, wrote to Messrs. Kidston & Sons of Glasgow, Scotland, declaring his need for steamboats of 300 horsepower and approximately 800 tons, stating, "I shall want these vessels to be of the very best description and to pass a thorough inspection and examination of the admiralty." 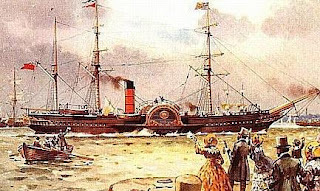 Of the four ships commissioned, the first to be delivered was the Britannia, which was launched less than a year later on February 5, 1840; she was followed in two months by the Acadia, and then the Caledonia, whose maiden voyage came in September of the same year; finally, in January 1841, the Columbia set off for the first time on the newly established two-week mail route. All four one-funneled ships were constructed of wood, propelled by paddles, and traveled at a speed of 9 knots. 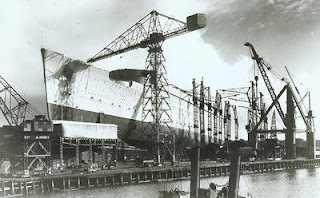 Ninety six years later, the three-funneled Queen Mary, also built in Scotland, was 70,000 tons heavier than her forebears, formed of steel, propelled by quadruple screws, and possessed single reduction steam turbine engines. 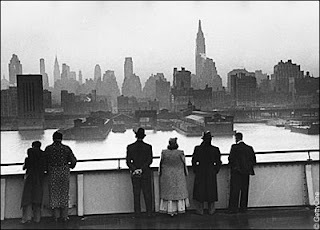 Additionally, the original batch of Cunarders could accomodate 115 first class passengers. In 1936, the Mary had room for 776. 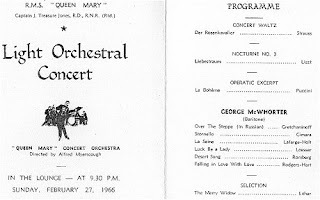 In the lounge from the "Queen Mary" Concert Orchestra on this day in 1966 - La Boheme or Luck Be a Lady. Something for everyone. On this day in 1948, Joe Louis arrived in England to appear in the Health and Holiday Exhibition at Earl's Court in London. Before departing, he took side trips to Paris and Brussels, making a considerable dent in the $40,000 he was paid for his appearance (half the agreed upon fee, the exhibition sponsors having gone bankrupt. A Swedish promotor stepped in and offered the Brown Bomber a chance to tour Scandinavia -- but was turned down when he proposed paying Louis in ice skates). 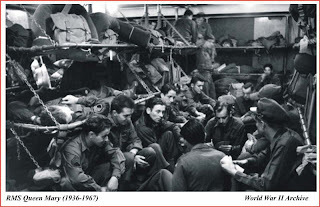 On this day in 1944, Commodore James Bisset leaves Gourock for New York to pick up 11,950 American G.I.s and bring them back across the pond where, four months later, many would take part in the D-day invasion. The Queen Mary, traveling at 25.32 knots, takes five and a half days to cross the Atlantic. This was the 33rd voyage the ship had made in her capacity as a troop ferry. In the words of Prime Minister Winston Churchill, the Queen Mary, along with her sister ship, the Queen Elizabeth, were "Built for the arts of peace and to link the Old World with the New, the Queens challenged the fury of Hitlerism...to defend the liberties of civilization. Vital decisions depended on their ability continuously to elude the enemy, and without their aid the day of final victory must unquestionably have been postponed. To the men who contributed to the success of our operations...the world owes a debt that it will not be easy to measure." 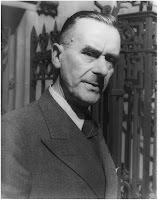 On this day in 1938, German novelist and Nobelist, Thomas Mann, was on his way to America aboard the RMS Queen Mary. During the trip, he wrote to his brother, Heinrich, noting that so far the crossing had been calm and that, "...the gigantic ship, nearly unassailable, it seems, rolled laterally just one day, and that doesn't make one seasick." Mann was in voluntary exile from the Third Reich. 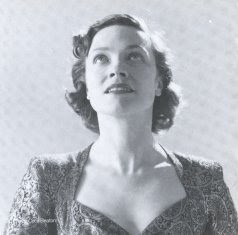 On this day in 1949, English contralto, Kathleen Ferrier, was on her way to New York aboard the Queen Mary. As the ship ran late due to bad weather, she was having a grand time, playing shuffleboard, deck golf, and ping pong, as well as partaking of new cuisine. In a letter to her sister, Win, she wrote: "I'm at the Staff Purser's table - a L'pool lad - so I'm all right!, with 2 American girls and 3 other males, and they're all fun. The chief steward has kept me supplied with fruit in my cabin - peaches, apricots, apples, oranges and black grapes, and altogether it's just unbelievable luxury. I've taken to oysters too and like them, and had corn-on-the-cob which tickled my ears and filled them with melted butter!" As for the weather, she notes, "It's been rough and we shall be a day late in New York, but I wouldn't have minded if it had been a week! I've never turned a hair - well, not more than two or three, and have enjoyed every meal. Lucky Kaff! I hope I can justify, with my singing, this luxurious living!" This was her second of three tours of North America. Pictured above is a trunk of money with which to pay troops of the 9th Australian Division, returning from action in the Middle East. It's being transferred from the Zephyr to the Queen Mary, which arrived in Fremantle on this day in 1943. From rich North-Atlantic crossers was rudely snatched last week the pleasure of traveling First Class. In London weeks of wrangling within the North-Atlantic Passenger Conference ended in a flabbergasting agreement by all North-Atlantic lines to lump all their ships into 20 different categories of Cabin Class. Top category: Normandie and Queen Mary. Second category: Bremen and Europa. Third category: Empress of Britain, etc. Thus all ships will escape the heavy First Class port taxes. 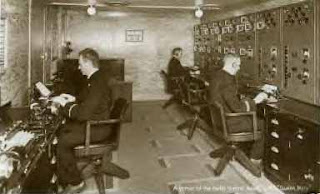 The squabble began, because of the advantage in tempting passengers aboard gained by U.S. shipowners in designating as Cabin Class at lower rates the Washington and the Manhattan which competing shipmen said were "so fine as to be really First Class ships." However, into the eighth category went these two U. S.-owned ships. 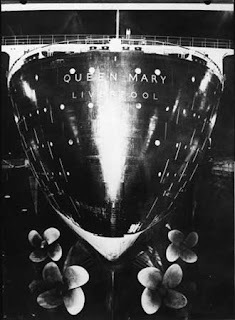 After other lines had beefed about this for years, Cunard White Star forced the issue to a reductio ad absurdum by announcing several months ago that Britain's forthcoming finest ship, the Queen Mary, would be Cabin Class and would undercut by $8 the First Class rate of the Normandie. When the Conference refused to agree to this, Cunard White Star handed in its resignation, which was withdrawn last week when the Conference agreed to a U. S. suggestion that from the North-Atlantic there be swept the glamorous First Class. Identical will be rates on the world's two largest, fastest and finest ships, the Queen Mary and the Normandie. South-Atlantic super-ships such as Italy's Rex and Conte di Savoia remained First Class, their owners not being members of the North-Atlantic Conference. On this day in 1947, the New York Times reports the outlook is bleak for ocean travel. All available ships are booked, with 40,000-60,000 pending applications for North Atlantic passage. Additionally, Cunard is not yet ready to release sailing dates for the Mauretania, the Britannic, or the Queen Mary, whose conversion back into a peace time ship had begun in September. (By the time work is completed in July, and sailing dates are finally announced, the ship will be booked through June of 1948). On this day in 1946, a million gallons of oil were pumped into the RMS Queen Mary directly from the 450-foot seagoing tanker, Peter Hurll, due to striking tugboat pilots preventing any oil barges from approaching the ship. It took twelve hours for two six-inch hose lines to fill 'er up. Though this wasn't the first time the ship had been fueled directly from a tanker, Cunard White Star officials called it "unusual." The Queen Mary at this time was engaged in bringing G.I. brides from England to the United States and was set to depart the following evening, Commodore Cyril G. Illingworth at the helm. 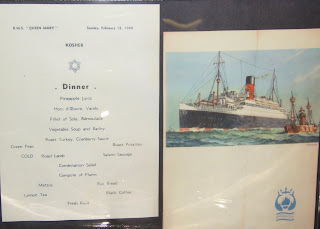 Kosher dinner on this day in 1949 consisted of, among other available entrees, roast turkey, filet of sole, or vegetable soup and barley. Also on offer -- compote of plums, matzos, and a variety of hors oeuvres. On this day in 1948, the Australian Rugby Union team departed England on the Queen Mary, heading for New York. The Wallabies, on a world tour that had also included stops in Ceylon, Yemen, Egypt, and France, were serenaded by a saxophone rendition of "Waltzing Matilda" as they boarded at Southampton. Among the highlights of their stay was a visit to Buckingham Palace where they met the 18-year-old Princess Margaret, and her parents, the King and Queen. They also stopped at the House of Commons and House of Lords, as well as 10 Downing where they met the Prime Minister, Clement Atlee. The team even found time to play rugby, defeating a combined team of Cornwall and Devon, but losing to the British Barbarians, 9-6. As the Queen Mary arrived in New York Harbor today in 1946, cutting through the chunks of ice that had collected around Pier 90, the 378th Army Service Forces band blasted Brahms' Lullaby, welcoming the British G.I. brides and babies to their new country. Rock-a-bye Baby was the encore - both songs done eight to the bar. The women showed their appreciation by dancing, waving, and applauding. According to WAC Captain Reida Longanecker, the women had been anxious about their arrival in the U.S., wondering if they would be resented for marrying American boys. Given their exuberant reception, they no doubt quickly realized that Americans were more hospitable than hostile toward their latest arrivals. 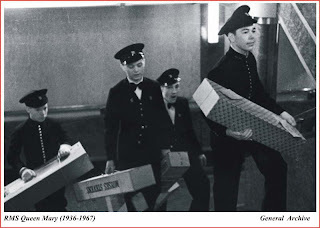 On this day in 1936, the New York Times reported that the Cunard White Star Line had employed the services of expert women homemakers to help cope with the enormous housekeeping tasks aboard its new liner, Queen Mary. Dining service was the first issue tackled by the ladies. According to their recommendations, a "Mechanical Molly" -- it washed, rinsed, polished and sterilized dishes, glasses, and silverware -- was employed in each of the ship's galleys in order to make food preparation quick and efficient. Conveyer belts also were installed to keep things moving between kitchens and dining rooms. As for keeping things tidy, the expert homemakers advised the use of the most modern of vacuum cleaners for the six miles of carpeting laid throughout the ship. (Making daily vacuuming easier, the ship's architects had designed hallways and staterooms with curved edges, providing no corners in which dirt could accumulate). The women helped to select furniture as well. 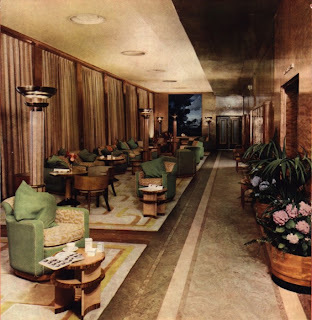 For the main cabin class restaurant, they examined eleven different designs before selecting one that combined armchair comfort with dining room utility; rose pink was then settled on as a superior fabric color, for its ability to complement ladies' dinner gowns. Another important aspect of design tackled by the home-management pros: closets. With their guidance and input, cabin class closets would be designed with full-length mirrors that lit up automatically when the door was opened. Also, hangers were molded in such a way as to protect the delicate fabric of evening gowns. And finally, roomy shoe compartments were added to accommodate a wide range of shapes and sizes. 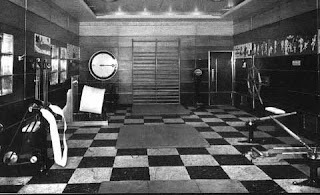 Additional touches suggested by the women were also adopted by Cunard White Star, such as private telephones, electric clocks, lighted vanities, and plugs for curling irons in every cabin class stateroom. Maria de Larrinaga ... requires immediate assistance -- hatch No. 1 stove in. Please proceed to my assistance -- urgent -- sinking. In response, two Holland-America liners, the Veendam and Noordam, as well as the Cunarder Aurania, and the American liner, Scanmail, hurried toward her position. However, upon arrival, none of the vessels could discover any traces of her. After her final S.O.S., which had come five hours after the first one, the Maria de Larrinaga was never heard from again. 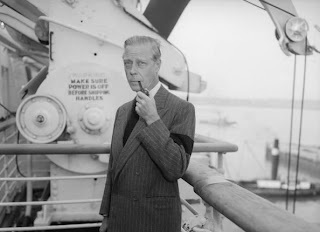 On this day in 1952, Prince Edward, the Duke of Windsor, boarded the RMS Queen Mary in New York in order to attend his brother's funeral in England. George VI, who became king when Edward abdicated the throne to marry the American divorcee, Wallis Simpson, died in his sleep of a coronary thrombosis. He had been battling lung cancer at the time. For the duke, it was not only a sad occasion, but a lonely one. The Duchess of Windsor would remain behind in New York. He is pictured here aboard the Queen Mary, which he and his wife referred to as their ship, wearing a black arm band as a symbol of mourning. 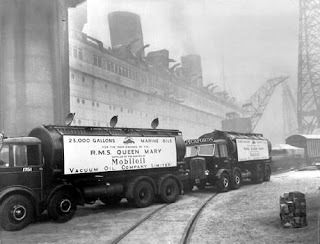 Today in 1953, Captain Donald Sorrell docked the Queen Mary without the aid of tugboats. It was the second time in the ship's history she was guided into her slip without assistance -- Commodore Robert B. Irving also had to go it alone in 1938. Both occasions were due to striking tugboat workers. (The ship docked in 1946 with the assistance of U.S. Army tugs, due to yet another strike). Sorrel required two attempts to find success. His first one was somewhat hair-raising for those who witnessed it -- the ship was caught by a current and it looked as if she might not only brush up against Pier 90, but plow into Pier 92, until engines were reversed and the Mary's four powerful screws churned her away from danger. Plan B went much better. Captain Sorrell brought his ship, the size of the Empire State Building, safely into her ice-littered West Fiftieth Street pier at mid-morning, during ebb tide. The New York Times called his achievement "a superb and daring exhibition of seamanship." Launches from the Caronia -- which earlier docked alone but had left a 15-foot dent in her pier -- aided the Mary as her bow entered the slip. Winches were then employed to swing the bow around, and, with some help from of the tide, the stern was moved into position so that the ship slid safely into her berth. 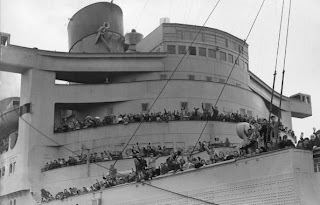 During the hour and a half it took to dock, an estimated 2,000 people had gathered to watch, shouting their approval at Cunard employees as they maneuvered heavy cables and hawsers stretching from the ship to the pier. When the Mary was finally moored, they let out an exuberant cheer. intended to use in establishing the first regularly scheduled transatlantic passenger service. The ship's maiden voyage took place almost exactly five months later, on July 4, which happened to be Samuel Cunard's birthday, as well as the anniversary of American independence. 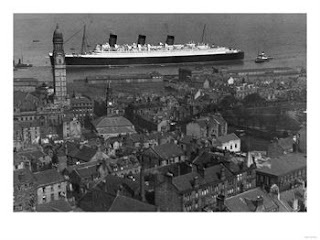 The Britannia took 14 days and eight hours to cross the pond; a hundred years later, Cunard's three-funneled Queen Mary, would take 4 1/2 days. On this day in 1946, the Queen Mary departed Southampton for the first time in her role as floating nursery. No longer needed to carry troops across the Atlantic, she would now serve as a ferry for G.I. brides and their babies, the cabin class suites having been transformed into nurseries. After enduring strikes, storms, and stowaways, she headed for the United States carrying 1,700 brides and 650 children (that's 2.6 babies apiece). For many of the women, this would be not only their first time aboard an ocean liner, but their first journey to America. On this day in 1938, the Queen Mary was a day into her crossing to New York after having undergone her first real overhaul. In an effort to reduce friction and make her faster, the preservative paint on her hull was removed. Additionally, engineers improved her machinery in an effort to achieve maximum performance. The adjustments apparently worked -- six months later she won the Blue Riband, surpassing the speedy S.S. Normandie. One of the precursors to the Theatre of the Absurd -- along with such well-knowns as Albert Camus, Jean-Paul Sartre, and Jean Cocteau -- French playwright Armand Salacrou arrived in New York on the RMS Queen Mary on this day in 1948. He had not come to the United States to stage one of his surrealist plays, but to take part in a meeting of 3,000 delegates at a United Nations Educational, Scientific, and Cultural Organization (UNESCO) regional conference in San Francisco. As for his choice of ships, there was at this time a lull in French shipping, as the S.S. Ile de France was in a shipyard at Saint Nazaire for restoration that would not be completed until 1949, and the S.S. Europa, having been turned over to France by Germany after WWII, had sunk two years earlier and would not be raised until 1950 (when she became known as the S.S. Liberte). 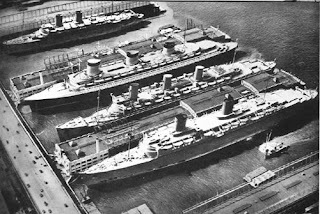 The S.S. Normandie [pictured above with the Mauretania, Queen Mary, and Queen Elizabeth] had, of course, burned in 1942 while waiting in New York Harbor for her conversion into a troop ship.